I am so excited to write this post today. After several years of blogging about food and parties for my blog, Formal Fringe, I took a cold, hard look in the proverbial mirror and asked myself one really important question: What do you want? It’s so simple, but so difficult to nail down: What do you want? I want a cookie and some spare cash to buy this bag. But I also want to be happy. I want to build something and some place online I can be proud of. I want to be a lifestyle expert. I want to build my brand. Once I gave myself a moment to be introspective and honest about what I wanted for my home online, I discovered that my goal isn’t so much to grow a publication as much as it is to grow myself. So I decided to fold Formal Fringe over into an eponymous lifestyle blog with a new domain and a new focus. Formal Fringe was about food and parties, but Taryn Williford is about a lot of different things. I’ll still write about food and entertaining and DIY projects, but I also want to share what I’m reading and watching, and bring you stories about building a creative career. 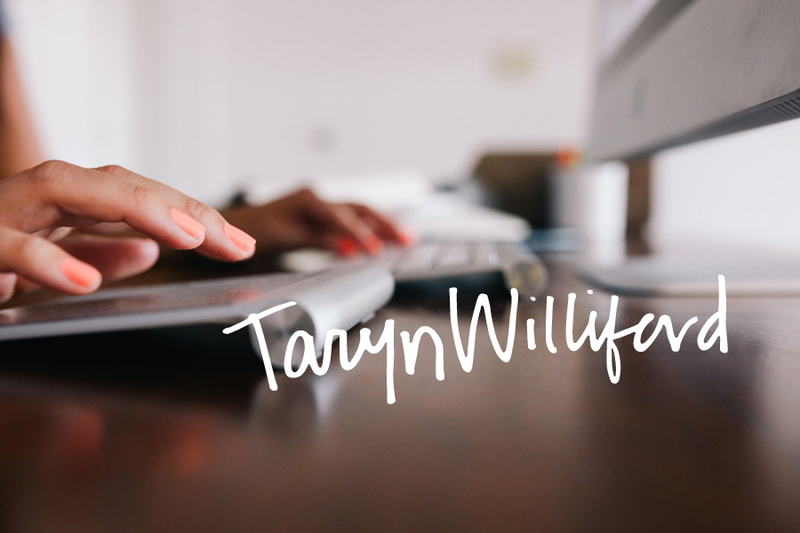 Tarynwilliford.com is a new site with a new mission: To share stories and ideas to help creative people make their mark. So take a look around (we’re totally mobile optimized now!) and let me know what you think. You can quickly navigate the latest posts in our four main channels—Gatherings, Lifestyle, Career and Culture—right from the home page. 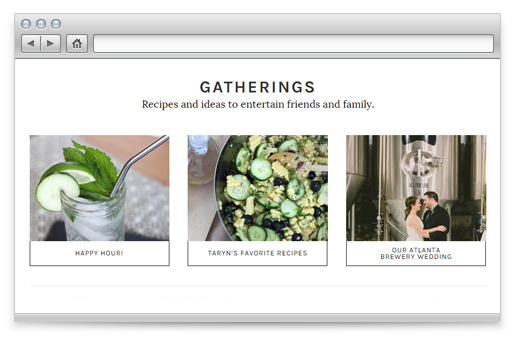 Or drill down into deeper topics, like the food and entertaining categories in Gatherings. There’s added content available inside each main channel. Inside these menus, you’ll find links to my favorite tags and categories, plus links to some relevant reads I think you’ll find interesting. I’m always sharing my favorite buys in posts, but I wanted to make it easy for you to see whatever I’m most coveting right now. This section in the sidebar highlights whatever is currently in my shopping cart. In the past 12 months, more than 40% of traffic to my site was coming from smartphones and tablets (and it’s growing every day). 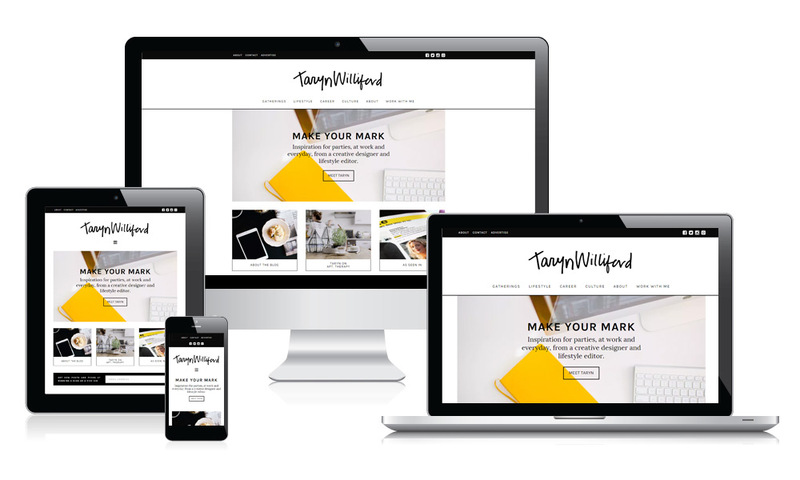 When I decided to take the plunge and bring everything in to a site and brand with my name at the masthead, priority number one was making sure the new site looked as great on mobile screens as it does on a desktop. 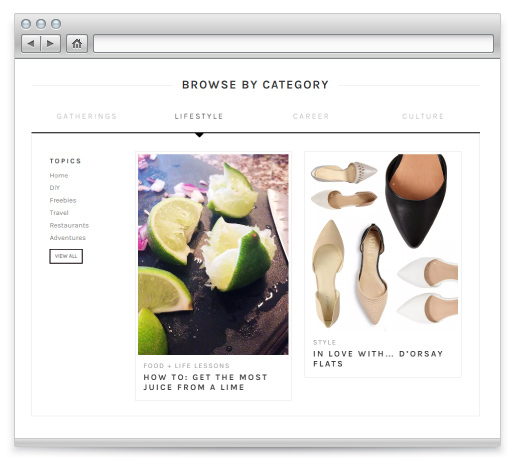 Here’s another new feature: I’m introducing an email list very, very soon. I’ll send out a “letter from the editor” each month, along with a few links to my favorite recent posts. Get in on the action now! If you’re interested in details about the new site design, check out the colophon. And please let me know what you think! 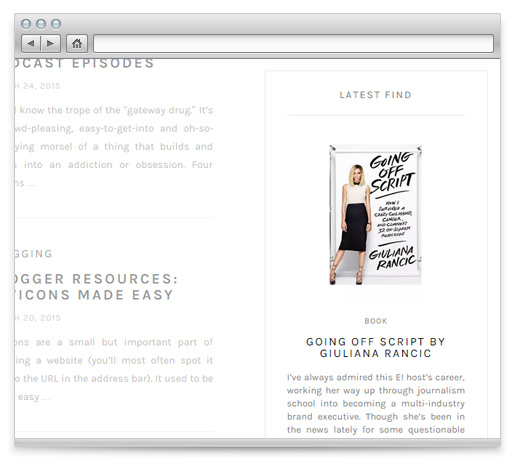 I love the new design and new feel of the blog. I have to say I am especially excited to hear what you are reading and watching/listening to. I love your style and know we have similar tastes in a lot of areas, so I am extremely excited for you to share more and for me to lose even more time on your blog! Thank you SO SO much, Elise!